Whenever Gerald Huggins sees video or photographs of poor, barefoot children, especially in Central America, he gets emotional. “I identify with them because I was one of those kids,” Huggins said. “It touches my heart.” A seasoned pilot and president of GH Enterprises, an aircraft maintenance company at the Baton Rouge Metropolitan Airport, Huggins, 64, was born in Costa Rica, raised in Guatemala and Panama, emigrated to the United States at 15 and became a citizen in 1971. “I remember being hungry. I remember being sick with parasites inside me,” he said. “I feel their pain.” Now he wants to help some of those children and their families by “being the hands and feet of Jesus,” said Huggins, part of a nonprofit Christian ministry called the Wings of the Spirit mission. For the first two weeks of February, Huggins and Daniel Waghorne, a documentary filmmaker from New Orleans, will fly the White Dove, a two-seater Piper Super Cub, from Baton Rouge to Central America and back. 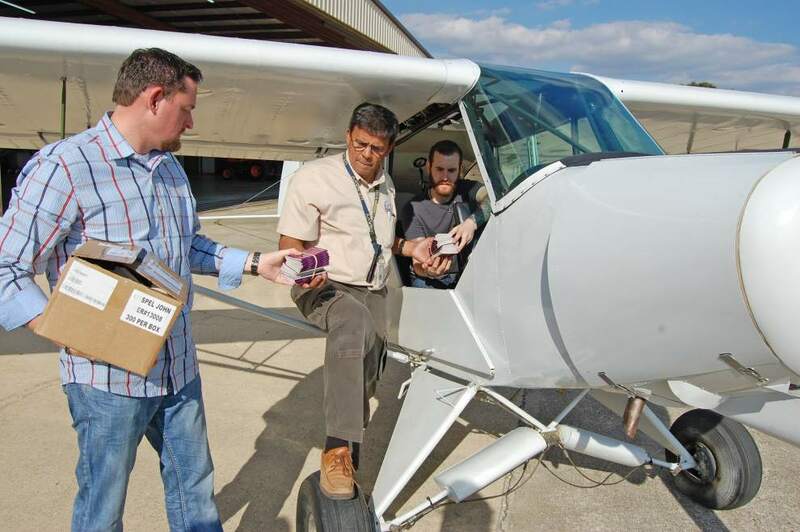 The small plane, which displays the mission’s logo in Spanish on one side of the fuselage and English on the other, can’t carry enough food to ease the physical hunger they may encounter, but it can airlift spiritual nourishment. As they hopscotch across Mexico and then down into Guatemala and Honduras, they’ll land near small villages and distribute a total of 900 free Gospels of John printed in Spanish. “We’ll stop wherever the Holy Spirit leads us,” Huggins said. A symbol of the Holy Spirit dove adorns the plane’s tail. Huggins described the Super Cub as a “semi-bush type of airplane, we can land and take off in fields if we have to.” They’ll fly at about 2,000 to 3,000 feet in altitude, low enough to see roads and villages. Although the “two-stick” plane is low-tech compared to the corporate aircraft he maintains, Huggins said they’ll have a GPS system and a satellite phone. They’ll travel about 400 miles a day at speeds up to 100 miles an hour, Huggins said. They’ll sleep wherever they can find lodging or, if necessary, sleep in a small tent or under a wing. They’ll head first to McAllen, Texas, then westward across Mexico to Mazatlan, then follow the coast south until they get to Tepic, Mexico, where in the 1990s Huggins said he assisted another mission group, Remote Area Medical. “I flew their doctors and nurses and supplies,” he said. They’ll fly down to Guatemala then eastward to a Gulf coast town, Porto Barrios, where Huggins said he lived while his stepfather worked for a banana company. He also plans to cross into Honduras to visit “a whole group of people who have been ignored forever — the Mosquito Indians.” They’ll return to Baton Rouge by flying back up the Gulf coast, totaling about 4,000 miles. Ryan Williams, president of the group and a local insurance agent, said he hopes this flight is only the first leg of a much larger mission that was divinely inspired from the beginning. Williams and Huggins attend Journey Church, where they became fast friends. Wings of the Spirit is a separate organization from Journey Church, Williams said. They met Waghorne in Guatemala last year on a church mission trip and Waghorne was there filming another group. They are hoping this trip’s success and Waghorne’s documentary will promote their greater mission of using this and another airplane to respond to disasters. For example, Williams said, when late-summer rainstorms flooded the Front Range of Colorado two years ago, it took Baton Rouge volunteers two days to drive there when an airplane could have airlifted them to Estes Park in a matter of hours.